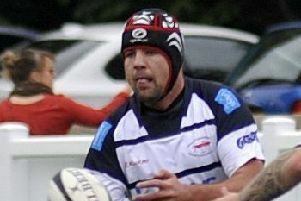 Preston Grasshoppers duly picked up the much hope for five points against bottom club Peterborough Lions. But the first-time visitors made them fight hard for their fourth victory of the National League Two North campaign. Head coach Paul Arnold said: “I challenged the lads for a five-point home win and a better defence. And that’s what they produced. The Lions coughed up the ball from the kick-off and Tom Davidson punished them with a simple penalty in the second minute. When Hoppers made it 10-0 after four minutes, it looked like a walk in the park. But Ruben Birch’s converted try – after Ally Murray ran back a clearance kick and Tyler Spence made good ground down the left before feeding Birch – was their last score for half-an-hour. In that period, the Lions piled on a lot of pressure to give the home defence a good workout, but they resisted powerfully and even had a couple of chances to increase the lead. 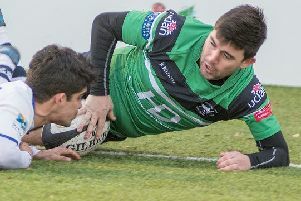 They were undone by an overthrown line-out and a missed penalty kick, but eventually they were able to take a 17-0 lead in at half-time, thanks to Connor Trueman coming off his wing on a great line and feeding Spence for a 35-metre run to the line and his sixth try of the season, which Davidson converted. More chances went begging early in the second half, with a poor pass ending one sweeping attack, Murray being penalised for a double movement after being held on the line and Birch unable to ground then ball after a line-out steal in the corner. But a series of five-metre scrums finally ended with Matt Lamprey crashing over for an unconverted touchdown. Peterborough took advantage of the extra man while Birch was in the sinbin for persistent offside, with skipper Nico Defeo scoring and converting after Davidson’s clearance was charged down. But Hoppers came back strongly to bag the four-try bonus, with replacement Alex Ward squeezing in at the corner after a line-out win. Davidson’s conversion hit a post. A great gallop by Murray was ruined when he bumped into Spence inside the 22 to concede a penalty for crossing. Then the busy Spence pulled off a try-saving tackle at the corner before sparking the best attack of the game with a mazy run out of defence which frustratingly ended with a Preston knock-on. There was just time for Davidson to miss a penalty before Hoppers could celebrate a fourth home win out of five to lift them a couple of places up the table to ninth.